Seven Clans make it on to The Shortlist in a nine-furlong handicap on the all-weather track at Wolverhampton, with a good score of 13, having four sections of green and one of amber. He looks well suited to this one and at a current price of around 9/2 is worth a closer look. Seven Clans hasn't run for a little over 200 days, however, his form last year was extremely consistent. His last six races have produced two wins, two second and two third places. Adam Kirby takes the ride again and has won twice on him in the past. Neil Mulholland appears to like coming to Wolverhampton as he has an excellent long-term record here. Over the past five years, he's had 16 winners (19.75%) and 32 places (39.51%) from 81 runners, for level stakes profits of 50.10 and 49.59 respectively and an Impact Value of 1.76. Adam Kirby has been riding well recently and enjoyed a few winners. Over the past 30 days, he's had seven winners from 37 runners (18.92%, for a level stakes profit of 3.00 and an Impact Value of 1.60. He also has a good long-term strike rate at this course, as over the last five years he's 156/745 (20.94%) for an Impact Value of 1.87. The Instant Expert report highlights the good showing of Seven Clans in today's conditions and shows that he appears far better suited than the rest of the field. He is 12 pounds higher than when he last won on the all-weather courses, which was over course and distance at the beginning of last year, but he has won on turf from a seven pound lower mark than todays. There isn't a huge bias when looking at the Pace report, although prominent runners do have the best strike rate. Akkadian Empire looks likely to be the early leader as he always shows plenty of speed, with Seven Clans likely to be held up towards the rear by Kirby who will wait for his chance to strike. 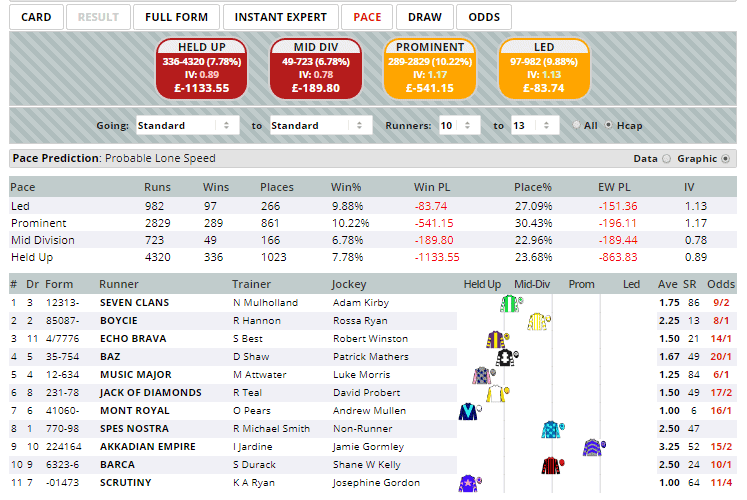 Click here for the 14:35 at Wolverhampton.